So Who's on the FAC Team? So you've seen all the FAC team members at the various animations we've put on. But have you met every one of them? Did you ever get chance to meet the star team members of the past? In any case, we decided to dedicate a little bandwidth to our team so you could get some insight on who they are. I joined The French American Center in 1991 and have had the pleasure of working many wonderful people over the years. I think that we have been able to promote cross cultural understanding and exchange and help people to learn English and French. 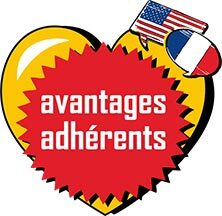 I am still very proud of the French American Center and am enjoying working here and have lots of plans after all these years! I have two children, Amélie and Ilana, who can call the FAC their second home. The center is my big project and I’m happy to have enjoyed such a positive working environment over the years. So I was working in interior design back in 1997 and one day I decided to move to France. I eventually ended up at the FAC where I took a job as an English teacher and, more importantly, I met Jeanette (who became and still is a dear friend). It took me all of a day to fall in love with Montpellier. I continued to work at the FAC until 2004. I then moved up to Paris to persue acting classes. After a couple years I moved back to the States with my lovely wife, Jessica. I worked for 3 years as head of land acquisition at a development company. Our next stop: New York City, where I worked for at an international real estate company. Does anyone see any link in all these jobs? I don't!! Now we have two children and we're back in Montpellier. I am still living in Edinburgh (for the moment anyway) working for a firm of surveyors and commercial agents selling commercial property (pubs, restaurants, hotels and shops) throughout the north east of Scotland. I play with a marching band in Edinburgh, which is really good fun, I do a couple of aerobic classes a week and drink lots and lots of wine. Yummy. I still miss France and everyone at the center so I'm sure I'll be back sometime soon to say hi but if anyone fancies a holiday in Scotland, give me a shout. I may not be in Edinburgh after the New Year but I will only be an hour away and I will have more bedrooms (hopefully) so it would be great to see you all. If you fancy saying hi, my email address is ruth@birse.ws or my mobile number is 0044 7711 939274. I come from a small British island called Jersey, just off the French coast (Never heard of it? Don't worry, you're in the majority). This means I'm British and not English, though explaining this to people is not always easy! After finishing school I spent four years at the University of Nottingham in England where I completed my degree in Politics. After that I spent a year working for Jersey's financial regulator. Having decided that finance was definately not for me, and craving more of that rarely experienced thing in Britain known as sunshine, I packed up shop and headed to Montpellier in the Summer of 2007. I started teaching at the French American Center the following February. I enjoy working at the Center as it gives me the opportunity to teach people about my culture and language, whilst at the same time learning more about French culture, whilst hopefully, having a good laugh with my students in the process! 2 What is your birthdate? 4 Oh really! What part of the states? 5 I love Boston...it's my favorite city in the world... What brings you to France? 6 Love? Are you married? Yes, my wife is from Toulouse. 7 Do you have any children? Our daughter is due in August 2009! 8 You must be so excited...So where have you lived? Yes, I'm VERY excited!! I've lived in Boston, New York, Portland, Seattle and Alaska in the U.S. Plus Dublin, Toulouse and I now live in Montpellier. 9 What did you study? I have my diploma in Early Childhood Education. 10 So you must like working with children? Yes, I love working with children. I was a Preschool and Kindergarten teacher for 7 years in the U.S.
11 What other types of jobs have you had? 12 WOW! That's a few jobs you've had there. What was the most different job for you? 13 Do you have any interests out side of teaching English? Are there any other interests outside of ESL teaching...? Well, if I had to pick I would have to say photography. 14 So you're a photographer? Did you have any expos in and around Montpellier? Yes, I've had two expos. One was in the Maison des Relations Internationaux (??? don't know how to spell that) and the second was in Pezenas. 15 Do you practice any sports? I do both indoor and outdoor rock climbing. 16 Really, what level are you? 17 How tall are you? 18 How much do you weigh? 19 What do you like about Montpellier? Well, like everyone else...the weather! and the proximity to the beach, mountains and countryside. 20 Last question. What are your future goals? To work in French schools as an English teacher. Well thank you very much for your time and I'll enjoy taking English lessons with you at the French American Center! I'm Kathryn and I come from Auckland, New Zealand. I studied French and Spanish at University and I've always been a francophile. I wanted to live in the South of France from the age of 13 and I haven't been let down. After planning to stay only 7 months, I'm still here nearly 3 years later. I love meeting new people from different walks of life and teaching at the French American Center enables me to do this. When I'm not working I can easily be found on one of the beautiful café terrasses around Montpellier in the sun, reading on the beach or just hanging out with my mates. Although I left the FAC almost 10 years ago, I still remember a lot about my experiences there. A year after leaving the Center, I moved back to England and worked in London for an expatriate services company assisting companies move staff . This was an interesting experience as we dealt with a variety of nationaliities being transfered to a wide range of destinations; someone even went to Albania. Whilst working in London, I completed an MA in French Studies, so putting all those years of learning French to good use. Also during this time, I met my husband and we got married in the summer of 2002. As he is Japanese, he took a position in Kobe, Japan and we moved there a few months after our wedding. We are now 3, as our daughter (Sophie) was born almost 2 years ago. At the moment I am a full-time mum and am busy bringing up Sophie and studying Japanese at the same time. Life here is very different to anything I had experienced before so really everyday can be pretty interesting. 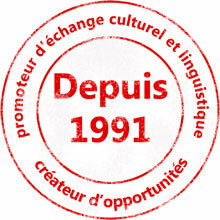 After teaching at the FAC (1998 to 1999), I darted off to Douala, Cameroon, where I taught English for two years. After that adventure, I decided to go back to school and completed a two year Master's degree in French translation in the States. I then took a job in Southern California working as a translation project manager in a translation company, but the urge to travel finally overcame me once again; I am now back in Montpellier doing a combination of teaching and freelance translation and enjoying being back here again! Life is good and I plan on staying here for a while...on verra bien ! Contact The French American Center if you are a dynamic native English speaker looking to become part of our team. So where am and what do i do.? Married to Valérie with a 2 year old son called Liam. Currently living and working in Fontainebleau for INSEAD, global business school as Operations Manager, in charge of Customer Service and Logistics for a portfolio of executive programmes worth 25 million euros. I have a team of 10 programme managers. Also temporarily running the Marketing operations team (7 people). After leaving the FAC in 1999, Katie Thompson and Zoubir Ouarti (both of whom worked at FAC) backpacked in South America for a year--and Katie taught English in Chile. They are now married and live in New York City with their daughter, Sophie. Katie worked as an editor at a magazine for a while, went back to school for a master's in European Studies and is now designing jewelry for her line, ktcollection. Zoubir just graduated from NYU after four years of studying and working full-time. He recently started a job for BODUM, the Scandinavian coffee and kitchen company. The only language instruction they are involved in now is in attempting to make Sophie bilingual, although at the moment she seems to have a language all of her own. Bernie is currently working full time as manager of the center. She lives with Vincent who is training to be a teacher. She practices boxing in her spare time and never misses a quiz night at shakespeares! Kira interned at the French American Center in 2005. What has become of her since? I graduated a couple weeks ago! It feels good to be done. I also will be starting work at Ameriprise Financial as a financial planner in about 6 weeks, and I'm really excited about that. I won't be using my French at all, but hopefully be able to find a way to use it. Like so many back-packing Americans, I stumbled on Montpellier and couldn't leave. Having no money, I decided to volunteer at the local library...thinking at least I'd get some free library rentals. Oh yeah, library books are free...(my money-making scams were less sophisticated in those days) Anyway, one day, one of the ORIGINAL FRENCH-AMERICAN professors (Douglas Sims, the man, the myth, the legend...) stops by the library and tells me that the boss lady at the French-American center is looking for a new professor. I rushed over to the center and low and behold, Jeanette Franklin hires me on the spot. I was able to negotiate a salary of 0 Francs/week. (Never attempt negotiations with Jeanette Franklin) Although my salary was the same as in my library "career path", all my hungry body could think of were those FREE biscuits, cookies and tea (Earl Grey with milk, thanks). I decided to accept the offer. After fulfilling my role as the "official French-American Center copy-guy" for about 6 months, I finally got my first big break... my first class. This officially began my career as an English professor... one of the coolest jobs I've ever had. In search of more adventure, I departed the French American Center in 1995 on a sailboat across the Atlantic. Since then, I've worked mostly in the US and some in the Bahamas, made many cool friends and have had many opportunites where I've been fortunate enough to earn plenty of money as well... but I'd probably still take that job as "copy-guy" if Jeanette ever offered it again;) Looking forward to having a Wednesday afternoon tea with my favorite and most flamboyant boss sometime in the future! Well here we go, everything you've ever wanted to know about me. I was born in Australia, in a small country town....blah blah blah.... Now i'll tell you the exciting stuff. When i was 21 just after finishing my degree in business hospitality i left to travel europe for 6 months. One thing lead to another and i have never left. My main interest is playing rugby league or rugby a13 for the frenchies. My other great past time is being a handyman in my house. I love learning how to do something new. The reason i'm teaching at the F.A.C is that i love to talk and share my experiences with people at the same time teaching them something i love to do myself, which is SPEAKING ENGLISH. ooroo it's australian for goodbye. After having had an enormously enriching experience at the French American Center, I was able to get my MA degree from the Université de Paris I, La Sorbonne, Institut de Géographie. Upon receiving this, I came back to Montpellier to work as a lab and field technician at the European Biological Control Laboratory, Agriculture Research Service, United States Department of Agriculture. After this job, I had a surprise stint working as an excursions guide (G.O.) with Club Med. From here, I went on to get my Ph.D. from the University of California at Davis' Geography Graduate Group. At present, I am an Assistant Professor and Interim Director of the Tourism and Hospitality Program in the Geography Department at Central Connecticut State University. I'm still in UK, Loughborough, and living at home (aged almost 31!). I've been working and studying for the past couple of years. I passed the graduate diploma in law this year which means I can go on and do law type training now. I've just started a Masters course at Sheffield in Biotech law and ethics which looks quite juicy, after that I'm not totally sure which direction to take. I'll keep you updated! I still teach English - most recently at Loughborough Uni and am hoping I can do more work there despite commuting up to Sheffield for this course. I just noticed this week that Ryanair (bless their cotton socks!) have put on an East Midlands - Nimes flight starting soon so I really won't have any excuse not to come out to your neck of the woods for flying visit now that Stansted is taken out of the equation.